A SILENT soldier who longs for home will this year take his place in a community which has searched for their own lost hero for decades. In 2018 the world marks the 100th anniversary of the end of the First World War in 2018 and the County Durham hamlet of Tursdale will make its own commemoration by welcoming Not Much To Ask into its heart. 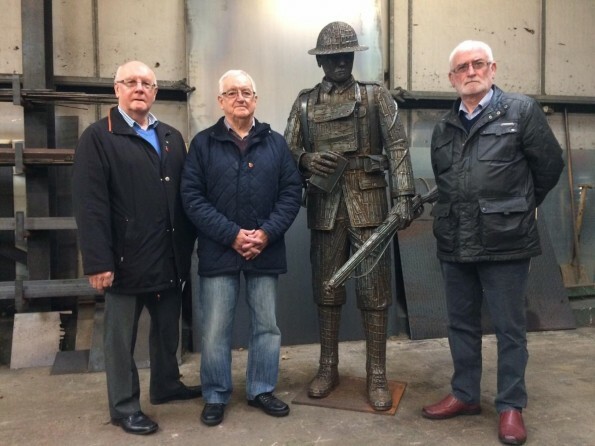 The statue of a war-weary soldier, created by Ray Lonsdale, will be installed on an existing war memorial in Tursdale and officially unveiled and dedicated on a poignant date which has yet to be announced. The occasion will mark the end of a long project to replace the memorial’s original Sicilian marble statue, which stood on the stone plinth from 1922 before disappearing around 40 years ago. The memorial was paid for by people from the former pit community in memory of the 41 local boys and men who died in the conflict. Local lore suggests that labourers working on the A1(M) between Bradbury and Bowburn in the 1960s knocked the soldier’s head off with a spade during a drunken walk home. The rest of his body disappeared after it was taken away to be repaired in the 1970s. The centenary of the 1914-1918 war brought it back into the minds of residents and Cornforth Parish Council, whose boundary it now sits within, raised the funds to commission South Hetton-based Mr Lonsdale to create a replacement. 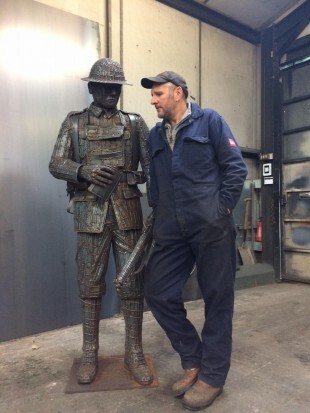 About ten years ago Mr Lonsdale made the leap from fitter to self-employed artistic steel fabricator and, since selling his first piece to a luxury hotel in the south through a Birmingham gallery, he has become something of a go-to man for commemorative sculptures. One of his most famous is 1101 in Seaham, nicknamed Tommy, and inspired veteran Norman Hyland to suggest that the parish council turn to Mr Lonsdale for help. Mr Lonsdale said: “It was nice, flattering to be asked to replace one that went missing in the 60s or 70s. Mr Hyland, of Spennymoor, served with the Army for 30 years and his grandfather was the only one of four brothers to return from the war. He and the council’s clerk Ray Sunman and chairman Alan Hodgson travelled to Mr Lonsdale’s Two Red Rubber Things studio to see the finished piece. Councillor Hodgson said: “We couldn’t have wished for anything better, it fits in with the First World War but looks modern too. “I think it will be the perfect tribute to the boys and men of the community who never returned from the war. Mr Sunman said the memorial will be cleaned and the statue installed soon and the council will arrange its dedication on a significant date during the centenary year.